"but all I wanted to do was sneak out into the night and disappear somewhere, and go and find out what everybody was doing all over the world..."
Check back to the real thing soon it should be up and running by the end of this February! The Attachment of Fear is Carrie Bilbo's 2009 Senior Thesis Collection at Pratt Institute. This Collection has been exhibited at the Pratt Senior Thesis Exhibition in March 2009, the Pratt Show at the Manhattan Center in May 2009, and The 2009 New York JA Show at the Javitz Center in July 2009. 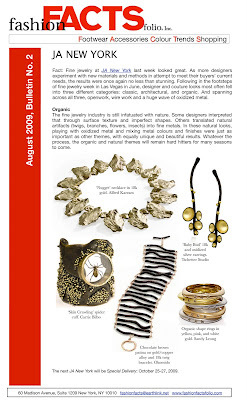 It has also been featured on the Nylon Magazine Blog, The Art Jewelry Forum, and most recently Vogue.de. 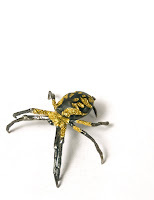 My collection of sculptural jewelry explores some of the ordinary objects and insects commonly associated with phobic behaviors while suggesting the characteristics that may provoke the strongest sensations of each of them. A paradox between the beautiful and the creepy is also explored and further extended when inner anxieties are presented as body adornment. Whether it be a gigantic spider on your shoulder or a head piece of branches masking one from the outside world, these fears are shown dramatically attaching themselves to the body both physically and psychologically. 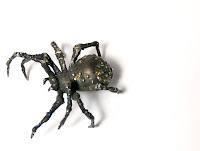 For my collection I chose to represent three phobias: Dendrophobia, or the fear of trees, Entomophobia or the fear of insects (particularly flying insects) and the most common phobia, Arachnophobia, the fear of spiders. The evolutionary development of the human psyche can account for many of the fears that terrorize mankind. Humans have learned through time to fear anything with more than two legs, therefore the many legs of a spider or the spine crawling feeling of those legs creeping up your body are innately terrifying. I selected aspects of a spider along with aspects of the other selected phobias and exaggerated them just as the human responses to the fears are themselves an exaggeration. The legs of a spider, along with the wounds of a tree, or the wings of a cicada are represented on the body both literally and conceptually through their feeling, texture, color, and sound. These interactive works made of precious metals and gemstones are attaching themselves to the very bodies that instinctively fear them. 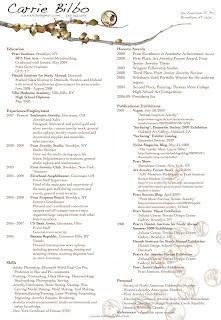 The Attachment of Fear is Carrie Bilbo's 2009 Senior Thesis Collection from Pratt Institute. 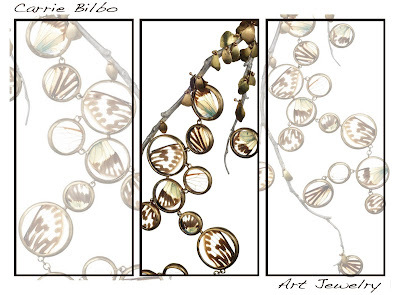 A graduate of Pratt Institute, Carrie Bilbo studied painting and drawing before discovering her most expressive medium was in metal. She graduated with honors with a BFA in Jewelry and Metalsmithing in 2009. While studying jewelry design, she worked summers and school breaks in her hometown of Cincinnati, Ohio as a jeweler for a custom jewelry shop, creating pieces in gold and precious stones. At just 22 she has already received numerous awards and honors. 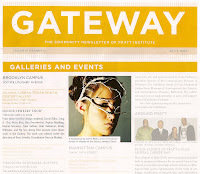 At Pratt she was named a finalist in her class foundation year, was the third place Junior Jewelry Review winner and received the First Place Senior Jewelry Award. 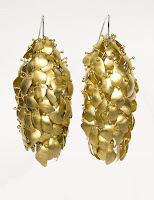 She was named a finalist for the Windgate Fellowship and since her graduation she has shown in juried exhibitions and shows including the National Enamelists Society Show in San Jose, California and the 2009 Craftforms exhibition in Philadelphia where her work was selected for the jurors choice award. She also will exhibit at SNAG’s 2010 No Boundaries show and Exhibition in Motion in Houston, Texas. Recently Carrie was named a NICHE award finalist.Her work has been shown in Vogue Magazine, Nylon Magazine and Art Jewelry Forum. Organic and expressive is how Carrie describes her work. Each piece is a well- crafted work of art. This style stems from her interest in painters like Gustav Klimt and the German/ Austrian expressionist movement as well as the Art Nouveau movement and jewelers like Rene Lalique. Jewelry is more than just decoration, it is wearable pieces of art, and what better canvas is there than the human body? 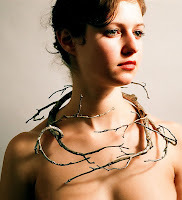 Carrie has joined her love of creating, painting, the human body and mind, and expression to create her unique and enticing art jewelry style.